I will be the first to admit, when I see a great player out on the field I don’t give much thought as to what it took to get him there. Obviously the player had to dedicate himself to the game, hone his skills and pay his dues in the minor leagues, but what about on the organization’s side of the ball. How much time was dedicated to looking at this player and assessing if he had the skills to be a major leaguer. How much time was dedicated to teaching this player the correct way to play the game and help him progress in his career. All these things we don’t think about, but then I have to ask the question, who are the people who help make these decisions and find the talent out in the world? Today’s book is one of those that showcases a man who has dedicated his life to finding these diamonds in the rough. When I started this book I was not sure I was going to get anything of any substance. I was thinking what could a scout tell me that I would find interesting about Major League Baseball. I thought it was going to be tales about driving through cornfields and dust storms to find the next big prospect, for kids that usually didn’t pan out anyway. I am very happy to say, boy was I wrong! 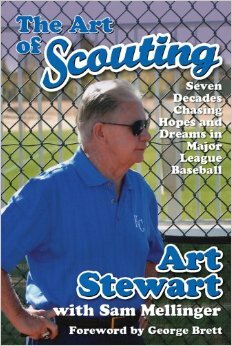 Art Stewart has dedicated his life to finding the next great thing for the game of baseball. A career that included a stint for the New York Yankees, Art is best known for his great work helping build the Kansas City Royals basically from the ground up. The author tells us stories of efforts to build a farm system for the franchise that will reap benefits at the major league level for years to come. Stories of beating the bushes trying to find the next great one and tireless effort put in to each prospect to find the right fit for his team. Through hard work, a loving wife and a great owners in Kansas City it has allowed Art Stewart to excel in his field and have an illustrious career. This book is very enjoyable because it allows you to see what really goes into scouting of players. The analysis and skill assessment that each player must be evaluated with and the pride that comes along with each players success is showcased for the reader. It really is more than just going to a game and waiting for the players to show something remarkable. There are always hidden talents out there waiting to be discovered. The Art of Scouting has really changed my perspective on how I view a scouts role within the game, and I now see what a vital part they are to any organization. Any baseball fan should enjoy this book. It shows you what goes on behind the scenes of any organization and what a vital role they have within any team. The scouts are an under-appreciated group that should really get some more recognition for their contributions to the game.